Looking north on Main Street from Sheldon Street, around 1903-1906. Image courtesy of the Connecticut State Library. 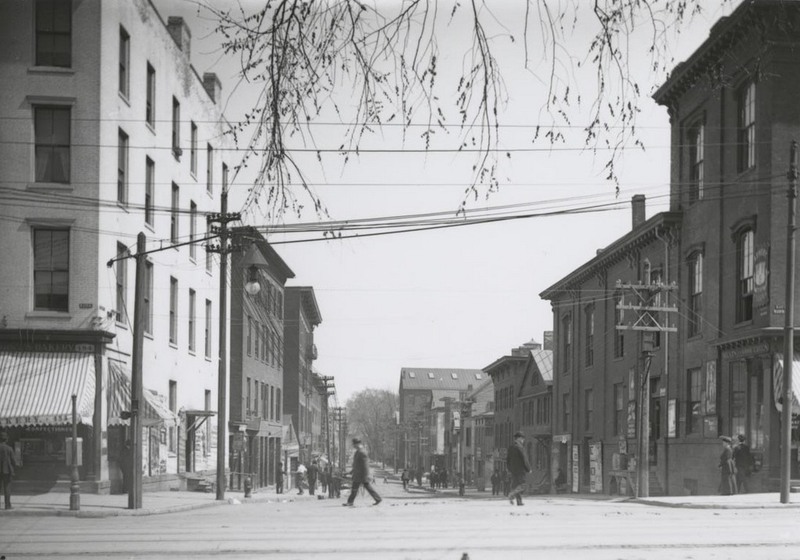 When the first photo was taken, this section of Main Street just south of downtown Hartford was still an assortment of low-rise brick commercial buildings, most of which probably dated back to the mid 19th century. However, this would soon change. Already, larger buildings were rising in the distance, including the Travelers Insurance building, partially visible in the distant center of the first photo. Also building around the same time was the Wadsworth Atheneum, hidden from view at this angle but located on the right side of Main Street. This museum opened in 1844, but by the turn of the century they were looking to expand their building. At the same time that these buildings were being built, though, others were coming down. 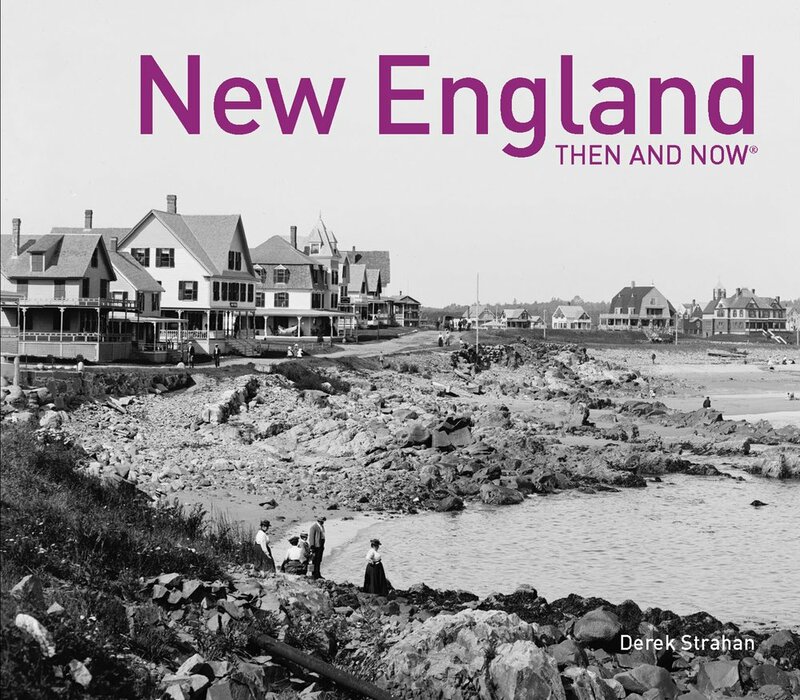 The first photo was taken shortly before St. John’s Episcopal Church, seen in the right center of the photo, was demolished to make way for the Atheneum expansion. The commercial buildings further to the right would soon disappear, too. By 1915 they would be demolished to build the Municipal Building, located at the corner of Main and Arch Streets. Today, not much is left from the first photo. The Atheneum is still there, and is partially visible behind the trees, and the only other surviving landmark is the Travelers Insurance building, which was greatly expanded in 1919 to include the tower in the center of the 2016 scene. 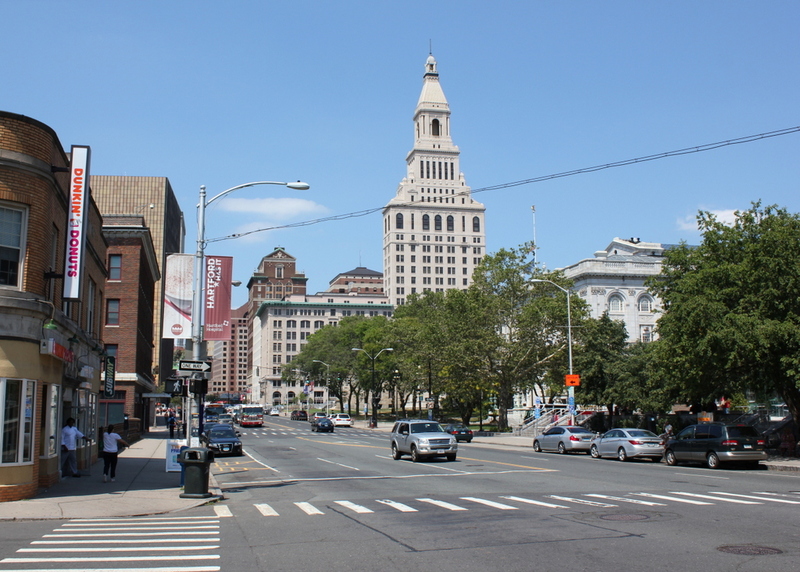 The only other prominent historic building in this scene is the Municipal Building, which was completed about 10 years after the first photo was taken and still functions as Hartford’s city hall a century later. Looking east on Sheldon Street from Main Street, on April 18, 1906. Image courtesy of the Connecticut State Library. 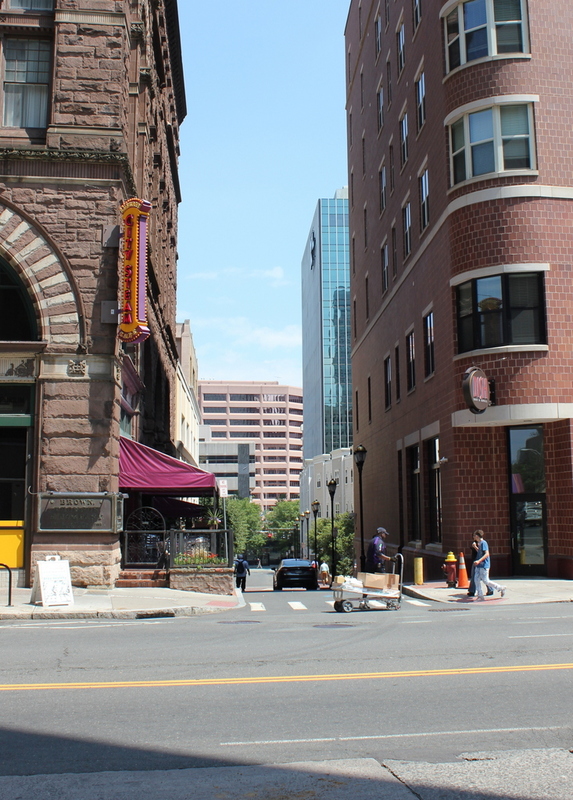 Located in the southern part of downtown Hartford, Sheldon Street has undergone some significant changes in the past century. 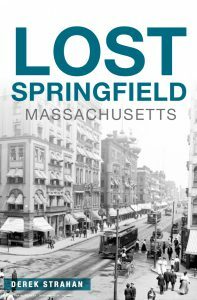 Most of the buildings from the first photo are late 19th century brick commercial buildings, and none of them are still standing today. 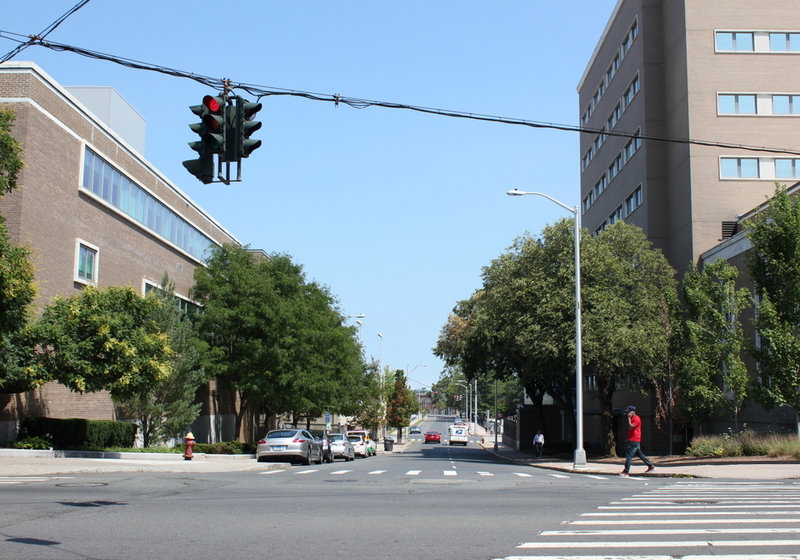 Most would have been gone by the 1950s, when two major public buildings were constructed on either side of the street. On the left is the Hartford Public Library, which was built in 1957 and extensively renovated in 2007, and on the right is the Abraham A. Ribicoff Federal Building, which was completed in 1963 and houses the U.S. District Court along with other federal offices. 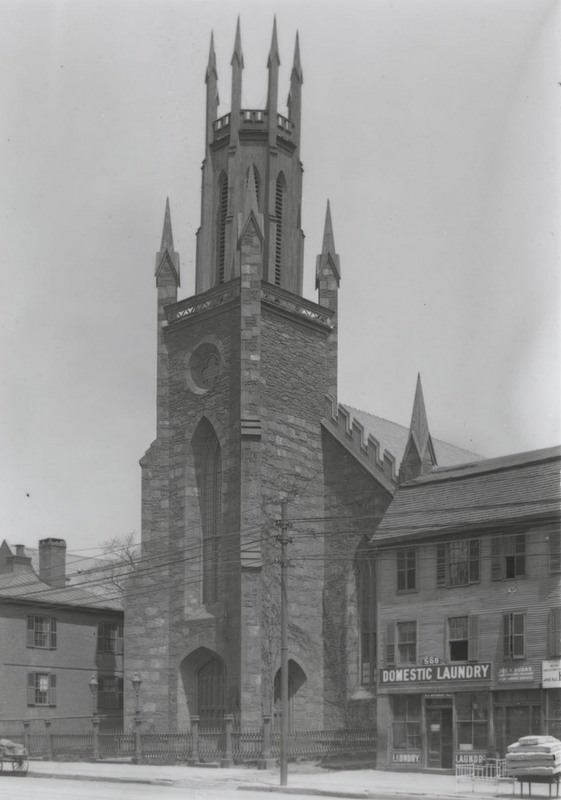 St. John’s Episcopal Church on Main Street in Hartford, around 1903-1906. Image courtesy of the Connecticut State Library. When this church building was completed in 1842, it was one of two Episcopalian churches along Main Street in downtown Hartford, and it was designed by architect Henry Austin in the Gothic Revival style that was popular at the time. The same style of architecture can be seen today in the Wadsworth Atheneum, which was completed just north of here only two years later. The congregation remained here for over 60 years, but by the early 20th century this section of Main Street had become predominantly commercial, and the property was being eyed for an expansion of the Atheneum. The church sold the property in 1905 and moved to a new location in West Hartford, and the old building was demolished to make way for the addition. 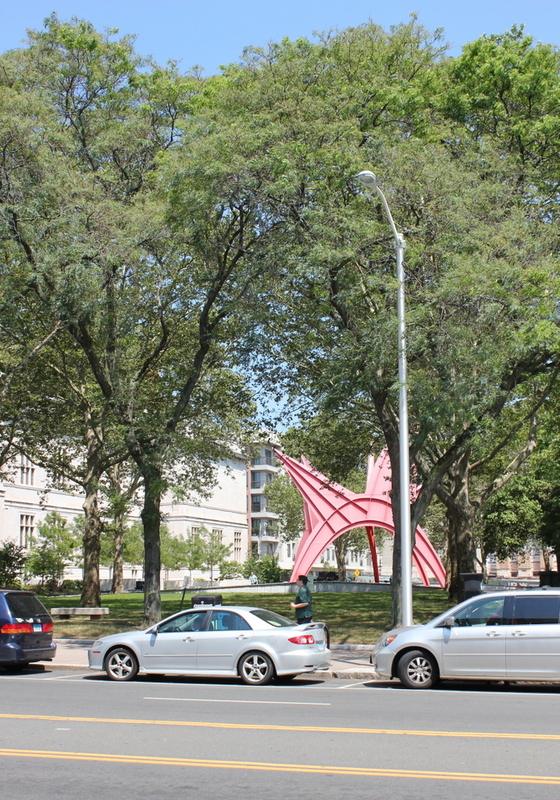 Today, the site of the church is now partially occupied by a small park, located between the Atheneum on the left and the Hartford Municipal Building, which is just out of view to the right. Looking east on Morgan Street from Main Street, on April 22, 1906. Image courtesy of the Connecticut State Library. These photos show the same scene as the ones in this earlier post, just from the opposite direction, facing down the hill toward Market Street. 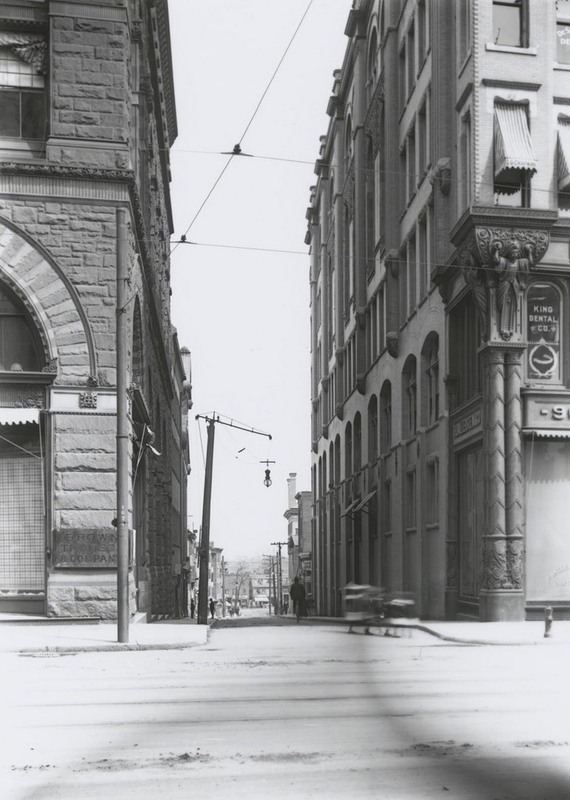 When the first photo was taken, this section of Main Street was somewhat on the northern edge of the downtown area, as shown by the signs here in the storefronts. Instead of the prominent department stores, banks, and insurance companies a few block south of here, this area had businesses like a wallpaper store and a grocery store. 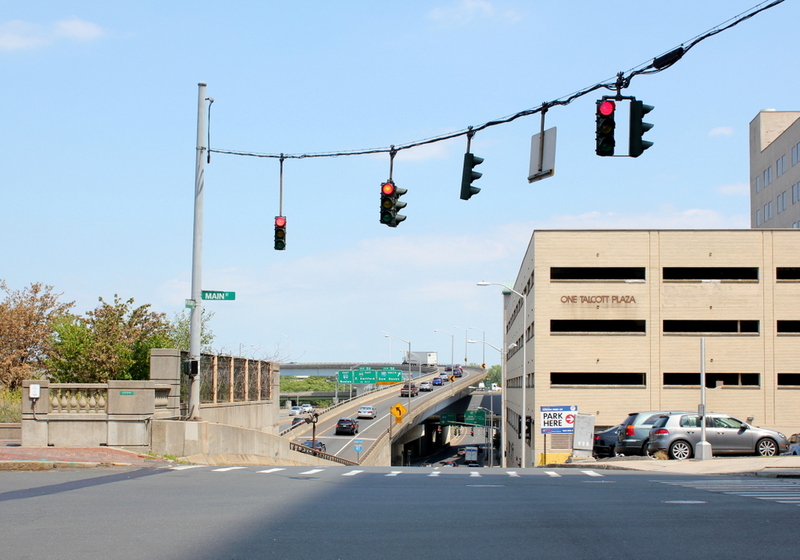 Over a century later, this spot has become an even more stark dividing line between the downtown central business district and the northern part of the city, with Interstate 84 now passing through the left side of the scene, and the interchange with Interstate 91 in the distance. On the right side of the photo is a parking garage, which was once part of the G. Fox department store complex here. 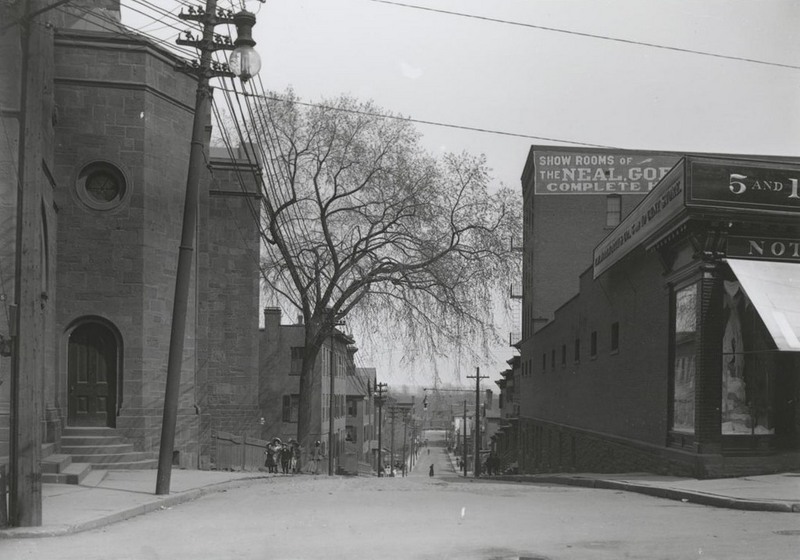 Like most of the other photos that William H. Thompson took in the early 20th century, there are no buildings left from the first photo, although the Bulkeley Bridge, which was under construction in the distance at the time, is still standing at the eastern end of Morgan Street. Looking east on Talcott Street from Main Street, on April 22, 1906. Image courtesy of the Connecticut State Library. 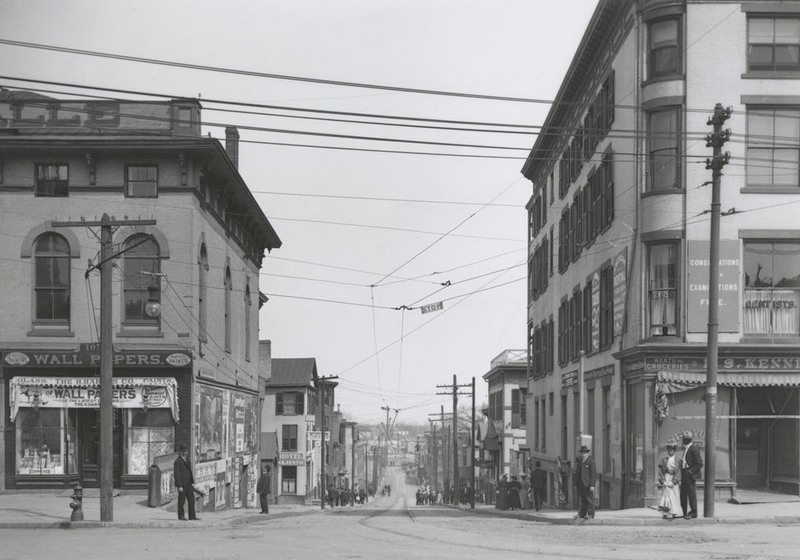 This first photo was taken just a block away from and on the same day as the one in the previous post, and it shows Talcott Street facing down the hill toward Market Street, where a photo in another earlier post was taken. As mentioned in that post, the buildings that dominate the present-day scene were originally the home of the Hartford-based G. Fox department store. The company was located here when the first photo was taken, in a much smaller building just out of view to the right. The one-story building on the right side of the first photo was a Woolworth store, and on the left side was the North Baptist Church. Just over 10 years after the first photo was taken, the G. Fox building burned down, along with the neighboring Woolworth building. Based on the photos here, it appears that the section of the building along the Talcott Street side was preserved and incorporated into a new Woolworth building, but G. Fox completely rebuilt, opening the present-day building in 1918. The facility was later expanded to include a warehouse on the left side of Talcott Street and a bridge connecting the two buildings. At some point, the North Baptist Church building was also demolished, and is now a parking lot. As for G. Fox, the company was a major Hartford retailer for nearly 150 years, before closing in 1993. Their former building here has since been converted into the Capital Community College, and it is listed on the National Register of Historic Places, as one of several historic department store buildings still standing in downtown Hartford. Looking east on Temple Street from Main Street, on April 22, 1906. Image courtesy of the Connecticut State Library. 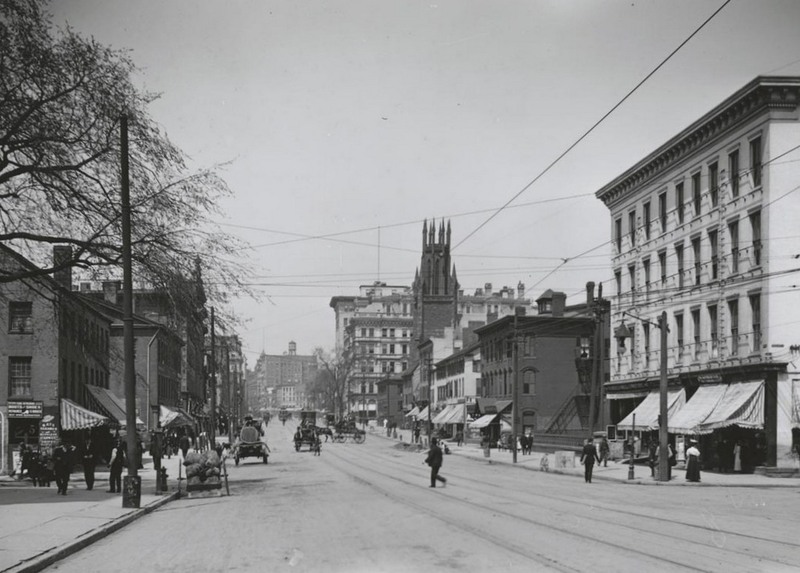 Of all the street views that photographer William H. Thompson took in downtown Hartford during the early 20th century, there are very few buildings that survive today. 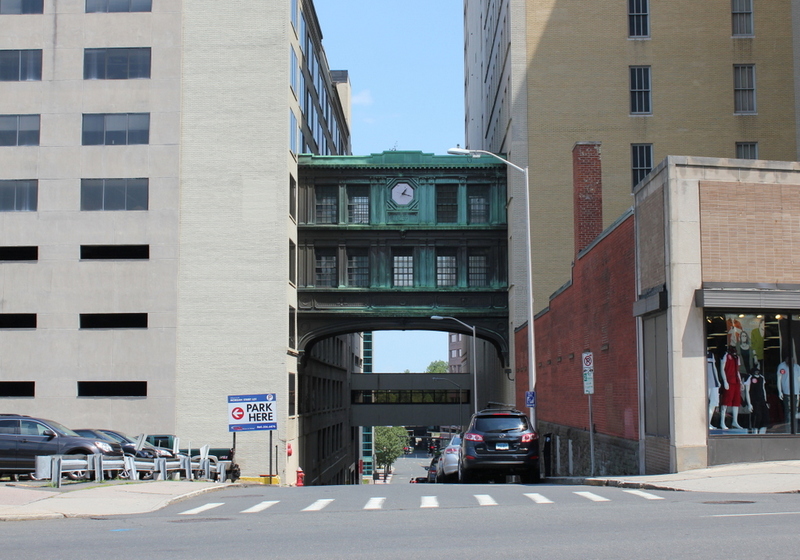 One of the few is the Cheney Building, seen on the left here at the northeast corner of Main and Temple Streets. Only a small portion of this massive building is visible here, but it clearly shows the Romanesque details of the building, which was designed by prominent architect Henry Hobson Richardson. Although better known for grand public buildings such as churches, city halls, libraries, and railroad stations, he also designed some commercial buildings, including this one here, which was completed in 1876. For many years, the Cheney Building was home to the Brown Thomson department store, and was one of several department stores along this section of Main Street. The company was later purchased by G. Fox, whose flagship store was directly adjacent to the building. G. Fox expanded into the Cheney Building, and remained here until the company closed in 1993. Today, although all of the 19th century buildings around it are long gone, the Cheney Building has been restored, and is now a Marriott hotel, with stores and restaurants on the ground floor.